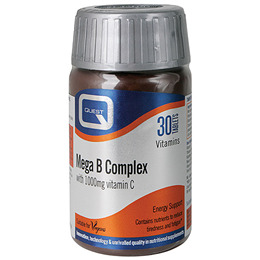 Quest Mega B complex includes 1000mg of vitamin C and may help improve wellbeing for those under stress. As a group, the B complex vitamins are involved in energy generation and the functioning of the nervous system. Why use Quest Mega B Complex? May help the body to manage during troubling times. Vitamin C (with hypromellose), Bulking agent: Microcrystalline Cellulose, Pantothenic Acid, Vitamin B6 (Methyl Cellulose), Riboflavin, Niacin (as Niacinamide), Thiamin Mononitrate (Methyl Cellulose), Choline Bitartrate, Inositol, Para- Aminobenzoic Acid (Methyl Cellulose), Biotin (di-Calcium Phosphate), Anti-caking agent: Silicon Dioxide, Peppermint Oil, Folic Acid (di-Calcium Phosphate), Glazing Agent:hypromellosecellulose. 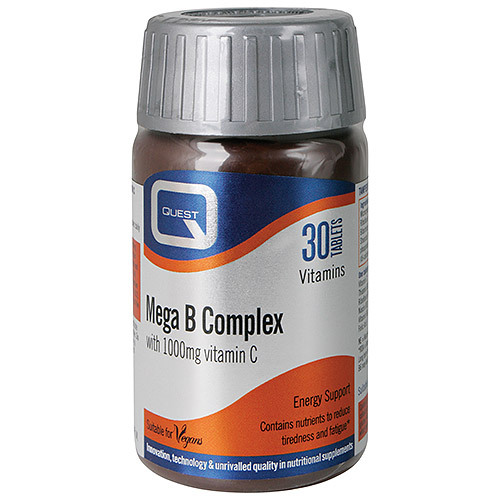 Below are reviews of Mega B Complex - B Vitamins + Vitamin C - 30 Tablets by bodykind customers. If you have tried this product we'd love to hear what you think so please leave a review.